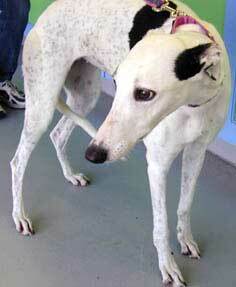 RCA, aka AZ Voltmeter, is a cute 3-year-old white and black female greyhound, born April 26, 2001. Her sire is Gable Dodge and her dam is AZ High Voltage. RCA's racing career started at Gulf Greyhound Park November 19, 2002, and she finished January 30, 2004 in Ebro, after racing also at Corpus Christi. 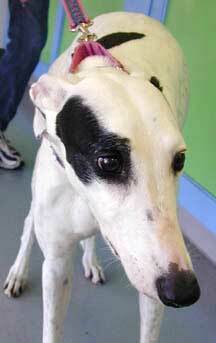 RCA is a gentle girl with an easy disposition. It is not known at this time if RCA is small animal or cat tolerant.